Data visualizations can often tell you more than you’d otherwise get by poring over the actual data itself. The above animated pie chart, which is based on official RIAA figures and originally appeared on Digital Music News, demonstrates clear shifts in music revenue over the past 30 years that we’ve all likely noticed — or maybe even predicted — but may not have visualized to its full extent. No single graphic about the past can reveal the future of a whole industry, but we’ve highlighted five notable trends indicated by the animation. 1. 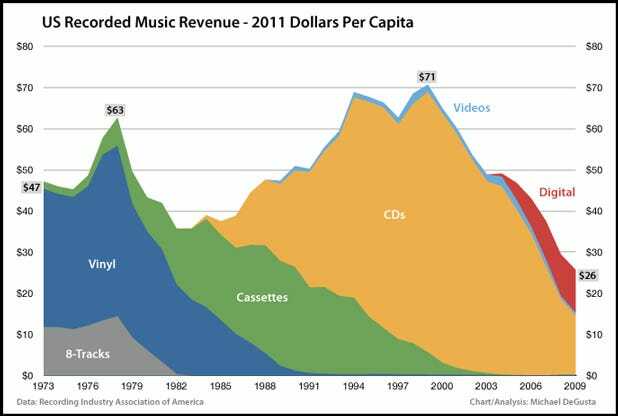 The CD had a pretty good run: From its first appearance on the chart in 1984, CD sales lost no significant ground until 2005, when this physical format had occupied at least 90 percent of the pie since 2000. 2. The single is the new album: Though digital downloads grow steadily, digital single sales quickly eclipsed them in growth rate and share of revenue. 3. Mobile rising: The first “true tone” (meaning that it plays a segment of the actual song) ringtone appeared in 2002, but the ringtone boom really took off in 2004 — and it wasn’t until 2005 that third-party ringtone services became widely available in iTunes and elsewhere. That’s also when we see the first noticeable chunk of music revenue from the mobile sector, with 3.4 percent. Mobile ate its largest piece of the pie in 2008, with 11.1 percent, but fell to 7.7 percent by 2010, reflecting the collapse of the $3 ringtone market in favor of cheaper and free options, including apps that let you make your own. 4. Streaming and subscriptions are gaining ground: Digital performance royalties, which streaming radio services like Pandora pay to copyright owners through SoundExchange, are increasing, but still represent a relatively small slice of the pie. Likewise, revenue from subscription services made gains from 2005 to present. 5. Digital retailers aren’t the only saviors of the music industry: Though the iTunes music store launched in 2001 as the first digital retailer licensed by all of the major labels, digital download stores don’t form a relevant portion of the pie until 2006 — and still paled in comparison to physical in 2010. For all the insight we can glean from percentage data, it doesn’t answer one crucial question: How much, or how little is the pie shrinking over time? Evolver.fm confirmed with Digital Music News that variation in the chart’s size is a formatting issue, and does not represent gross revenue for each year. That makes it difficult to gauge the extent to which new revenue streams are replacing the old on a dollar-for-dollar level. Still, it’s food for thought. @hugome: Your chart is wrong as it isn’t inflation adjusted.. This one is inflation and population adjusted..
See the following article for more..